Acknowledged author wrote MARINE BIOLOGY 5 comprising 592 pages back in 2017. Textbook and etextbook are published under ISBN 0190625279 and 9780190625276. 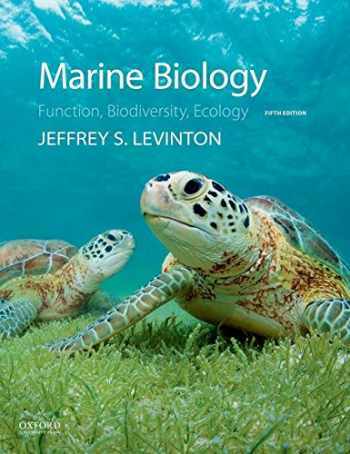 Since then MARINE BIOLOGY 5 textbook received total rating of 4 stars and was available to sell back to BooksRun online for the top buyback price of $71.34 or rent at the marketplace. With its clear and conversational writing style, comprehensive coverage, and sophisticated presentation, Marine Biology: Function, Biodiversity, Ecology, Fifth Edition, is regarded by many as the most authoritative marine biology text. Over the course of five editions, Jeffrey Levinton has balanced his organismal and ecological focus by including the latest developments on molecular biology, global climate change, and ocean processes.